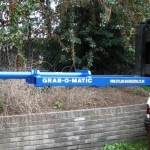 The Grab-O-Matic Low Profile Reel Boom is a fork attachment for the lifting of reels or rolls of film, paper, carpet etc. 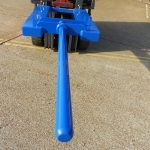 The Low Profile Reel Boom can be quickly and easily attached to the forks of a fork truck and secured by either ‘T’ bolts, heel pins or the new quick attach/ release system, and is available in a range of sizes to suit various reel weights, lengths and core diameters. 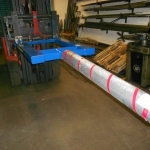 The attachment allows various diameter reels to be loaded or unloaded from lorries or racks without the need for the fork truck driver to dismount from his cab to attach the reel to the boom. 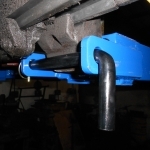 Heel pins can be specified to secure the unit to the forks in place of T-bolts. The reel boom can be designed for various size and diameter of reels. All reel booms have aa profile bull nose for ease of entry. 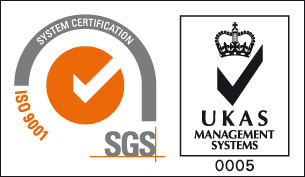 Customer specified boom lengths and diameters can be manufactured to order.